It’s not just about catching thieves. The concept of “inventory shrinkage” once conjured up images of sneaky shoplifters and nefarious organized retail crime gangs. But if that’s all you’re chasing, you’re missing a huge chunk of the problem—and costing your company millions. Today’s inventory management experts say that retail shrinkage is more difficult to detect and prevent due to the major disruptive forces in the retail industry (including online shopping, mobile retail, and others). Leveraging data and analytics more effectively is critical for LP professionals who want to address risks that can impact profitability. Find out how other retailers are collecting and analyzing data to proactively tackle risks. This FREE report also delivers practical, real-world examples of ways retail buyers can themselves help reduce shrink, and how to work more closely with them. Believe it or not, you, as a dedicated LP professional, can influence your entire company in your effort to identify and reduce retail shrink. This report shows you how. Read this FREE Special Report today. Tomorrow, you can begin enhancing your company’s profits and your own career. 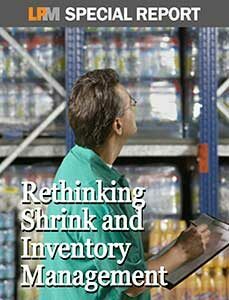 Enter your email and we'll send a link to the Rethinking Shrink and Inventory Management Special Report right to your inbox.